A white cement-based, polymer modified narrow joint filling compound for tile joints up to 3mm wide around all types of ceramic wall tiles. Sets to a hard, durable, water-resistant finish, suitable for interior and exterior applications. Conforms to: EN13888 Type CG Class 1. 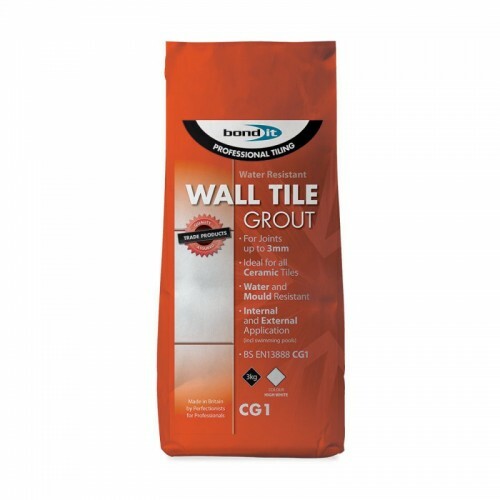 Ideal for all types of ceramic tiled surfaces. This product is waterproof making it suitable for both internal and external applications, including kitchens, bathrooms and shower enclosures, swimming pools. In fully immersed locations, the inclusion of an acrylic latex additive in the grout mix can enhance water repellent properties. Quick and easy to apply, providing a smooth joint which is unaffected by water or weather. See Technical Data Sheet for mixing instructions.